Enjoy a relaxing holiday on the beach, quiet nights filled with sound of waves and breathtaking views! 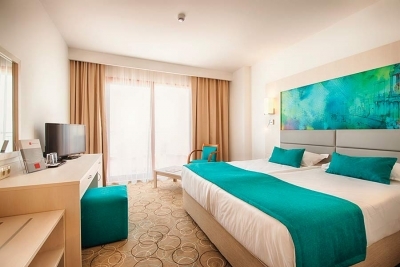 Hotel Riu Helios Bay offers an exclusive location directly on the beach of Obzor. Surrounded by gardens and small wooded hills, this hotel offers you nothing but the best that guarantees you a superb holiday! A freshwater swimming pool, Indoor pool, Jacuzzi, fitness room, Beauty center, Sauna and Massages will help you enjoy the refreshing holiday you need and forget the stress of everyday life! If you are looking for the best Bulgarian cuisine our buffet restaurant, themed restaurants and live show cooking will offer you a whole universe of flavors and aromas! The All Inclusive system meets all your needs. The complex offers activities for families, couples and groups of friends. You can practice various sports such as water polo, water gym, pedaling, volleyball, table tennis or take advantage of our sports center. Throughout the day, adults and children can take part in our entertainment program. The RIU Land Club ensures that your children will spend long and fun hours in the company of our professional animators. Adults can enjoy the daytime activity program, watch various daytime and evening shows and listen to live music in the late hours of the day. Above all, Obzor is popular with tourists seeking tranquility and breathtaking views of the sea. 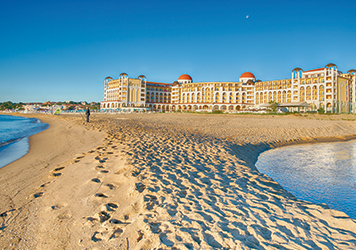 Thanks to the beach of Hotel RIU Helios Bay, you can enjoy the endless sea horizon and beautiful sunsets. As one of the beautiful cities in Bulgaria, Obzor is the perfect place for a walk with lots of green areas and untouched forests in its surroundings. We recommend visiting the nearby towns like Varna and Nessebar, rich in culture and social life. The hotel offers its guests spacious, comfortable and beautiful rooms in three main categories suitable for any type of accommodation.